"Goat is a delicious, mild-flavored meat that is overlooked in the U.S. This recipe results in a tender, savory dish that, while unusual, is still basically good old comfort food. This would be great to serve with Israeli-style couscous; alternatively, you could add some potato chunks to the pan halfway through the cooking." Heat the oil in a Dutch oven over medium-high heat. Season the goat shoulder with salt and pepper, and place into the pan. Brown quickly on all sides. Add the onions to the pan, and cook, stirring constantly until browned. 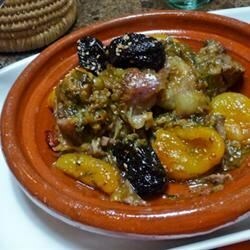 Mix in the prunes and preserved lemon; cook and stir for a few minutes to blend the flavors. Pour in the red wine and chicken broth, and bring to a simmer. Cover the Dutch oven, and bake for 2 hours, or until meat is so tender that it falls off of the bone. See how to make tender short ribs braised in sherry. First time trying goat, it is quite good and was very tender cooked this way. The reduction also makes a very good gravy with just some milk and flour added. Goat was extremely tender, had a very nice reduction in the end.